Join Smart Electric Power Alliance (SEPA) and Peak Load Management Alliance (PLMA) for this free webinar to understand the basics and the push for non-wires-alternatives projects based on stories from real practitioners. Hear directly from the SEPA-PLMA project team and key non-wires alternatives project representatives about results from the industry-wide call for NWA project case studies, including compelling lessons learned and challenges and opportunities that lie ahead. You’ll get the breakdown of what they have learned from 10 leading NWA projects representing different project sizes, geographies, and grid challenges. Please note: This webinar will be presented by SEPA in partnership with E4TheFuture and Peak Load Management Alliance. By registering for it, you are consenting to share your contact details: name, title, company/organization and email with E4TheFuture and PLMA. If you have any questions, or if you would like to cancel your registration for this webinar, please contact: Erika Tomatore at etomatore@sepapower.org. In today’s electricity market, non-wires alternatives are capturing public attention and inspiring decision makers to explore the grid benefits and potential cost savings resulting from integrating new distributed technologies in place of new infrastructure upgrades. As interest grows, industry practitioners are seeking out more information and lessons learned from past and existing NWA projects. 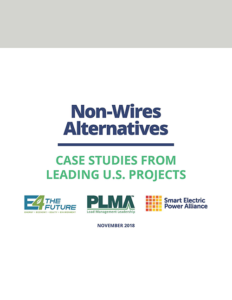 To help shed light on a broad set of NWA projects in the U.S., E4TheFuture, Peak Load Management Alliance and Smart Electric Power Alliance jointly selected 10 NWA case studies and have distilled insights into this report. This entry was posted on December 1, 2018 by Helen Deffenbacher.